The movie Sabotøren og Kureren is about the Norwegian resistance in World War 2 (released in Oct 2017). I made the film music, my largest musical project so far. AND: Lillebjørn Nilsen named my record 13 Impossible Dances one of his top 5 favourite Norwegian albums, in a survey made for artists performing at the Norwegian Wood festival – together with legends Radka Toneff, Knutsen & Ludviksen and Slinkombas. This comes from an artist who I’ve always admired, one of Norway’s best songwriters. Siden 2003 har jeg gjenopptatt min gamle drøm om å lage musikk. Fra 1976 til 1992 spilte jeg fele i band som Folque og Ym-Stammen, og laget instrumental-CD’n «13 umulige danser» som ble mye spilt på 90-tallet. Pr idag spiller jeg i Oslo Radio-Orkester som gjør jazz fra 1920-40-tallet på vår egen måte – og, fram til 2017 Folque, som har hatt 4 revival-konserter 2014–17. Jeg gjør fortsatt en del grafisk design og har de siste årene begynt å tegne og male igjen. Men siden ett av de tre albumene er nesten ferdig, jobber jeg mye med dette. Det er en pianoplate med tittelen «Harpa som spilte av seg selv». I always wanted to make music, to paint (or draw), and make graphic design. I took education in all three professions and ended up doing them all (tough not necessarily at the same time). Born Oct 3, 1952 in Oslo. My family comes from the West and North of Norway. Rauset is the farm where my father comes from, situated in beautiful Gloppen, Nordfjord. My mother comes from Rossfjordstraumen in Troms. Education: 5 years at Oslo katedralskole (high school – the institution is 850 years old! ); Statens Handverks- og kunstindustriskole (Norway’s Arts- and Crafts School) 4 years; Statens Kunstakademi (Oslo Art Academy) for 5 years; Østlandets Music Conservatory (now part of Musikkhøgskolen i Oslo) 10 years half-time study of violin, piano and music harmonics. Acquisitions: Norsk Kulturråd (Norw. Cultural Council); Statfjord B. Grants: Norwegian Illustration fund 1987; Govt.’s Travel- and Study Scholarship 1991 (to Egypt); Norw. Composers’ Royalty Fund 1997; TONO work scholarship 1997 and 2004; Norw. Composers’ Royalty Fund 2003, Norw. Composers’ Fund 2011, Norw. Composers’ Royalty Fund 2015. Some highlights of my working life (newest at the bottom). 1972: Debut at Høstutstillingen. Participated on the Norwegian «Salon d’Autumne», Oslo for 5 different years with paintings and graphic art. 1973 – 95: Book covers for various Norwegian publishers (Cappelen, Aschehoug, Oktober), among them Ingvar Ambjørnsen’s «Hvite Niggere» and Dag Solstad’s «Gymnaslærer Pedersen…». Øyvind playing in Karl Johans gate, 1977. 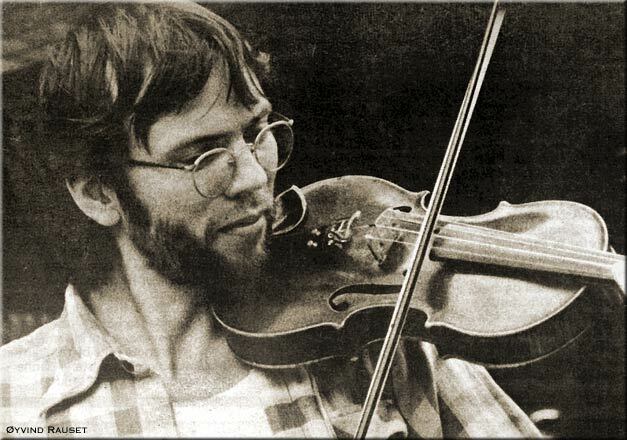 1973-76: Violin in the rock group «Strengegjengen» (LP «Trå Tell + big anti Eur. Melody Contest show in Chateau Neuf, Oslo 1976). 1976-77 I also played irish msuic with «Gamal Rull», and had a year on the road with rock group «Bazar» (a.k.a «Kark»). Øyvind playing in Folque, 1980. 1981: First separate exhibition in Groruddalen Art Club (was stopped by the local priest). 1985: Initiator of the pan-Scandinavian LGBT art exhibition «Natt & Dag» (Oslo, Stockholm, Copenhagen). The first gay/lesbian art exhibition in Norway. 1986: Participated on «Eroticism in Norwegian Art», Oslo Consert Hall. Public’s prize for most popular picture. Same year mentioned w/painting in Holger Kofoeds’s art book «Eros i Norsk Kunst 1880-1980-årene». 1987: Separate exhibit at Black Box/Aker Brygge, Oslo. 1988: First solo-CD: «13 Impossible Dances + 1 Improbable». 1989: Various smaller separate exhibits in Sandefjord, Trondheim, Oslo. 1989: First published essay in the antology «I min mors hus» (In Mother’s house), Pax Forlag. 1989-95: Graphics consultant at the Government Printer’s Office. In 1991 assigned to make the first digital versions of the Norwegian national emblem (Riksvåpenet) after the paper originals of Sverre Morken. Also worked for the Finance Department (PR for the Tax Reform 1992 and various state budgets) and the Prime Minister’s office. 1993-96: Violin/keyboard in the group «Ym-Stammen» (participated on 2 CDs). 1993, March: Live tv performance of «Danse Impossible» in show «Endelig Fredag» (Finally Friday) in NRK 1 with Jo and Tarjei from Ym-Stammen plus Anders Rogg on keyboard. Hosted by Anne Grosvold, Ole Kristen Harborg and the actor Rolv Wesenlund. 1994: Released Anders Rogg’s CD «When Waves Come to Die» on my indy record label. Siri Kvalheim, Elton John, Øyvind Rauset backstage in Oslo Spectrum, 1995. Separate exhibition, Gallery Metropol, Oslo. June: The lithograph «Loneliness with bedspread» was chosen as a coming-out award for Elton John, presented to him at his concert in Oslo Spectrum during his «Made In England» tour. Met Elton backstage before the show and he invited us to see it (Article from «Blikk»). 1993-2000: Freelance teacher for Statskonsult, Aktiv Opplæring, YS Utviklingssenter (courses in Photoshop, Illustrator, Pagemaker, PowerPoint and Adobe Golive). 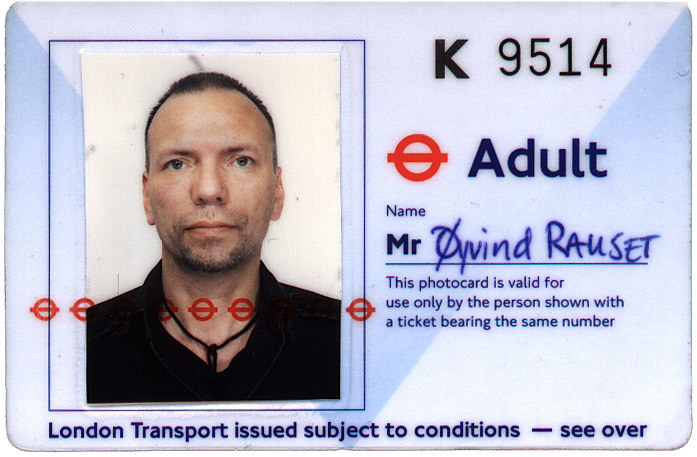 1995-2000: Freelance graphic- & web designer. Working for The Royal Family (monograms), YSU (Trade union website), Kripos (The Norwegian CSI website), Tempus (webdesign for computer firm), Norad (presentations), various publishing houses (book design). 1996: Music for the tv-series «Mellom Bakkar og Berg» (NRK 1). 1996: Played with Ym-Stammen at The Roskilde and Quart festivals. 1997: Separate exhibit: «Portretter & Nærbilder», Bryggen/Bergen. 1997: TV program (NRK1) from Ym-Stammen’s tour in the Faroe Islands). 1997: Violin in the Swedish techno/dance group «Polaris» (concerts in Oslo, Copenhagen, Frankfurt am Main). 1997-98: Violin in the tango group «Tanz Fatal». 1998: Music for tv series about the film photographer Per Høst (NRK 1). 1998: Received the Scandinavian Tupilak prize for gay artists: «Thor’s Hammer«. 1999: Theme music for the tv series «Ut i Naturen» (NRK 1). 1999-2000: Actor in the Pain Solution/Aurin Theatre play «Sandman/Key to Hell» (Oslo). May: Design of the Schengen Website for public info about the new passport rules according to the Schengen agreement (The Department of Justice). I also made a folder in 4 languages, produced in 3 million copies and sent to all homes in Norway. June-July: Wedding monogram for the royal wedding 25.08.2001 (HRH Crown Prince Haakon and Mette-Marit Tjessem Høiby). September: monogram for the Crown Princess Mette Marit. November: The graphic design of the wedding, including the monogram, received a design award from the Norwegian Design Council. Feb.: «Tornerose»: Music for a performance by Håvve Fjell/ Pain Solution in Kunstnernes Hus. March: Main guest in tv program «Stereo» on NRK1 with Nina Stensrud Martin..
March: Wedding monogram for HRH Princess Märtha and Ari Behn. June: One photographic work selected to be shown in the international Adobe Digital Imaging Competition. June: Theme music for the series «Grønn Glede» (Green happiness) on NRK1 tv. August: Some concerts with the rock group Bandkind (ZoomIn festival, Oslo). Since August 2002 playing with the retro jazz group Oslo Radio Orkester. October: First solo concert in Skuret Kulturpub, Oslo (with Folque and Oslo Radio Orkester in some of the songs). Jan.-May: Design of 500 pages picture book celebrating the 850 anniversary of Oslo Katedralskole (Oslo’s oldest public school), plus a song book (74 pages) for the same occasion. May: Composers’ scholarship grant (Komponistenes vederlagsfond) for making new melodies. August: Redesign of the Nye Skalder website. Dec 03 – April 04: 12 weeks number one on Østlandstoppen with «Reality Song». April: Monogram for H.R.H. Princess Ingrid Alexandra. June: 5 new compositions for «Viser Ved Kanalen», Telemark (bestillingsverk). Dec: Solo concert in Nye Skalder/Parkteatret, Oslo. Feb.-March: In Zanzibar studying Taarab music. August: Runner-up in the British-based Singer/Songwriter Award 2006, with «Sunday Afternoon at the Plaza». August/Sept: Composing for and performing in Afro-Norwegian dance performance «Cultural Unite» on the Innvik Theatre Boat (Oslo). Sept: Solo concert at Nye Skalder/ Mogador, Oslo. 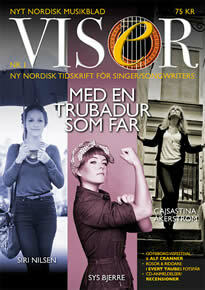 Feb-March: Redesign of the Norsk Viseforum website viser.no (the official Norwegian songwriter organisation). June: Making music on stage in the theatre play «Til Noreg der Kjærleik Ventar» at Det Norske Teater in Oslo – a cooperation between the Norwegian Theatre, Noregs Ungdomslag and Nordic Black Theatre. April: Only Scandinavian finalist in the International Songwriting Competition. April/May: Music on stage in the play «Til Noreg der Kjærleik Ventar» – Det Norske Teater, Scene 2. October: Made music and participated in the dance performance Heritage at Den Norske Opera. May: Performing at the Harare International Art Fair (HAIFA), Zimbabwe, with the dance company Heritage. 2010: Treatment for breast cancer, successful. Composerts’ fund grant (Det Norske Komponistfond) for 2 new songs for Oslo Radio-Orkester. Lillebjørn Nilsen includes Rauset’s «13 Umulige Danser» on his list of Norway’s 10 best records (Morgenbladet’s Topp 100). 2013: Editor of the Scandinavian music magazine VISER/VISOR. Revival of the Folque band: The new Folque, reestablished with most of the original members. Concert at John Dee, Oslo, sold out 3 months in advance. April 18: Folque extra concert at Rockefeller Music Hall, Oslo. May: Finalist in the Inernational Songwriting Competition 2014. Awarded «Honorable Mention» and therefore called a winner by the ISC. For what it’s worth here is the button. Film music for the movie «Offer eller spion / Victim or Spy» about Asbjørn Sunde (leader of the Osvald resistance group during WW2). Oct: 25.000 NOK from the Composers’ Royalty Fund to work on my new album. Music to the theater performance «Den der vanGogh’en», performed in Trondheim during the St. Olav days 2016. Working on the album Harpa som spilte av seg selv / The Harp that played by itself and film music for the movie Sabotøren og Kureren. 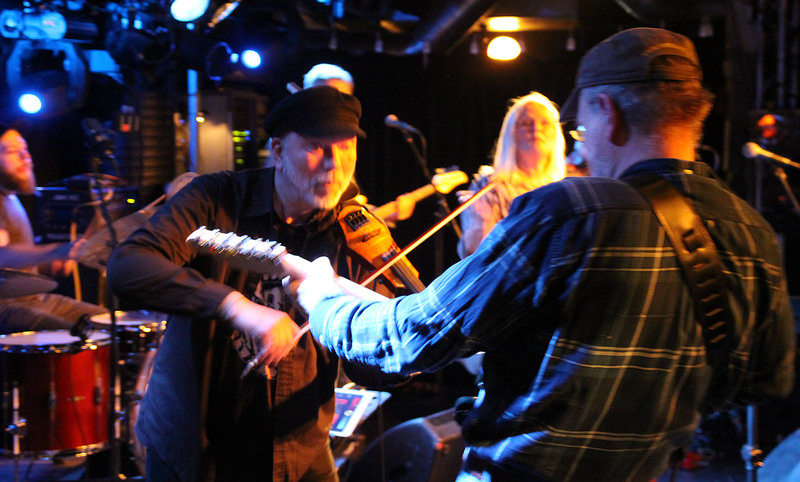 Intense moment on stage at the Folque concert in John Dee, March 2017, with Øyvind (left) and brother-in-law Morten Bing (right). Photo: Jan Storø. Folque’s farewell concerts in John Dee (Oslo, March) and Rockheim (Trondheim, April 30). 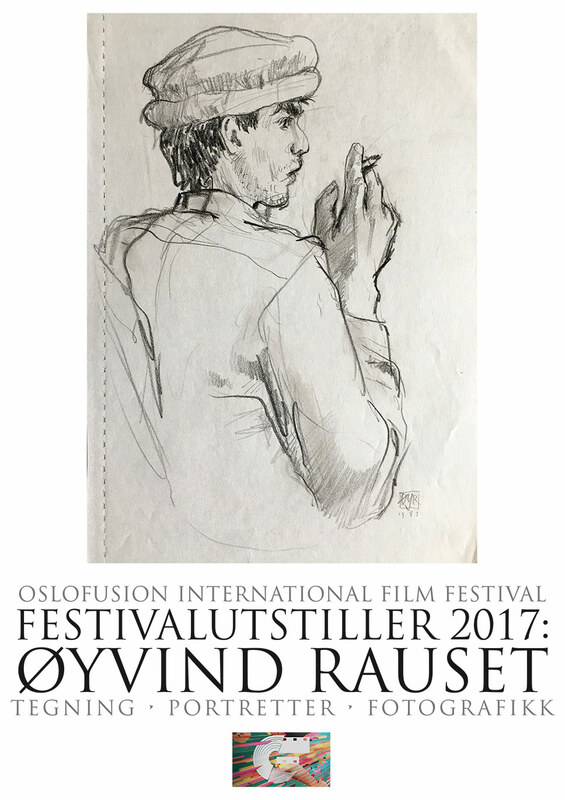 Festival art exhibition: A separate exhibition of drawings, paintings and graphics in Filmens Hus during the OsloFusion International Film Festival sept 2017. All film music for new full length movie Sabotøren og Kureren about the Norwegian resistance during WW 2. Launched on Oct 1. Lillebjørn Nilsen named my record 13 Impossible Dances one of his top 5 favourite Norwegian albums, in a survey made for artists at the Norwegian Wood festival. gå inn på denne kalenderen og skriv inn når du kan være med på en Ym:bayer! For en tid tilbake så satt jeg på Fornebu lufthavn og noet en solo, og det er en som henvender seg til meg og spurte om det var ok at han tegnet meg. Hvilket jeg ikke hadde noe imot. Nå leste jeg noe senere en bok som heter Hvite Niggere av Ambjørnsen med en tegning på koveret som likner svært så mye på meg, så jeg undrer på om har du tegnet den på Fornebu tidlig på 80-tallet? Spiller fortsatt både den gamle LP-en med deg og Burgess, så vel som CD-en med alle dansene! Virtuost og originalt! Har spilt CD-en for venner, men den er vanskelig å oppdrive i butikker, sier de. Hei og takk for de hyggelige ordene! Nei, de 13 Umulige Dansene finnes bare på iTunes/ Apple Music, Tidal og Spotify nå for tida!